"The blockade is contrary to the inclusive approach to citizens of Ukraine." The European Union urges protesters to stop blocking railway lines in Donbas. 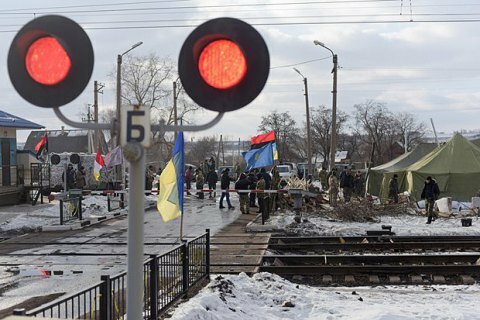 "The blockade of railway communication between the territories controlled by Ukraine and certain areas of Donetsk and Luhansk regions (ORDLO) is contrary to an inclusive approach to citizens of Ukraine who live in the territories where government bodies temporarily do not exercise their powers," Interfax-Ukraine quoted the EU Delegation as saying on Thursday, 16 February. The EU mission urges those involved in the blockade to immediately stop it. The authorities, in turn, should solve this problem as soon as possible, the statement says. It notes the importance of the transparent movement of goods across the demarcation line, which will facilitate the fight against illegal migration and smuggling. The EU is calling on the Ukrainian authorities to strengthen their efforts in this sphere. The EU also noted that the Minsk agreements remain the basis for a peaceful and lasting solution to the conflict with respect to the sovereignty and territorial integrity of Ukraine. The blockade of three railway lines in Donbas led to a halt of deliveries of anthracite coal to Ukrainian thermal power plants. Ukraine has declared a state of emergency in the power system.